Reading Comprehension Worksheets for Kids! In order to keep those reading skills sharp I’ve created a few fairly simple kindergarten reading comprehension worksheets for your kids! There’s no other way to practice reading comprehension than to, well read. Books are always great but sometimes kids need something they can interact with, where they have an active role and that’s where these worksheets come in. I’ve mainly used words that are commonly used in kindergarten reading (colors, simple objects…) but there is also a word or two that might require some additional help from adults (such as swimsuit). There are 6 summer themed reading activity pages waiting for you. 4 pages where kids have to read the instructions and color the pictures accordingly. 2 pages where kids have to read the sentences and connect them with the matching image. These will keep the skills up an ready for Grade 1! If you are thinking on giving your kids Grade 1 worksheets only do so if they find the ones meant for their skill level to easy and if they really like to solve them. 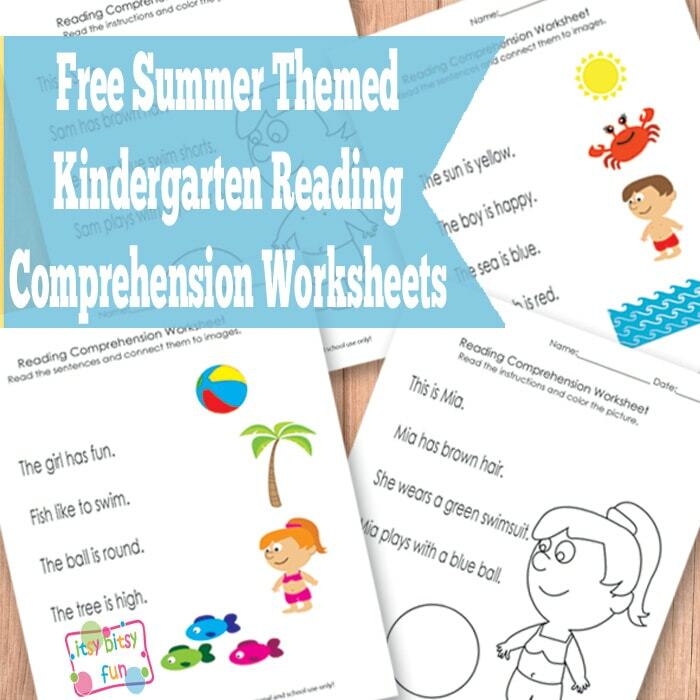 Get your own free printable Summer Kindergarten Reading Comprehension Worksheets here.